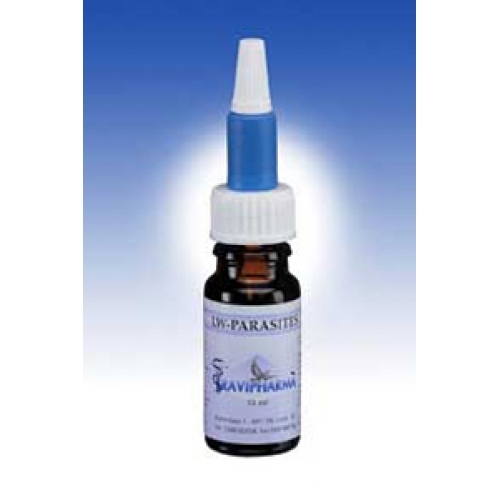 Luis-Worm - LW Parasites - by Travipharma is SPECIAL PRODUCT FOR PIGEONS AND VERY BIG BIRDS AND / OR CHICKEN! - External Parasites. - parasites such as, lice, mites, mites, mange and light worm infections, in racing pigeons, large birds such as parrots and chickens. * For topical application on the clean skin. - Pigeons Dosage: 1 drop in the neck on clean skin. Repeat every 4/6 weeks. For about 200 pigeons. After about 1 week you will see results. At first repeat use after 4 weeks for a prolonged effect. The average durability is about 8 weeks. Can be given all year round. - Large birds / poultry (chicken, etc.) Dosage: 2 drops in the neck on clean skin. Repeat every 4/6 weeks. After about 1 week you will see results. At first repeat use after 4 weeks for a prolonged effect. The average durability is about 8 weeks. Can be given throughout the year. It is recommended to give vitamins to your animals after a worm treatment (Travi-Vit or Condition-Mix). Treat all pigeons and birds from the loft individually.